Since the first issue of the handbook was published in October 2003, the field of material flow analysis (MFA) has developed rapidly, including hundreds of MFA studies all over the globe. MFA methodology has become a widely used technique in environmental management, resources management, and waste management. 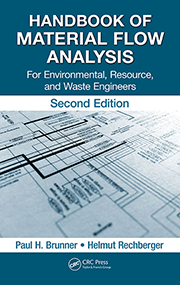 Today, most MFA done on a global basis uses the MFA methodology described in this handbook, because the methodology offers a concise, transparent, reproducible, and well-accepted framework for performing MFAs and substance flow analyses (SFAs).